With the decision to build a heavy gargo glider, requirements were specified, and the Hamilcar glider was borne. Designed specifically to be able to carry light tanks into battle, the Hamilcar was ideal for carrying virtually every type of heavy weapon, vehicle or supply load required for the airborne divisions. The Hamilcar carried both Tetrarch and Locust light tanks into battle, as well as being able to carry loads such as two universal carriers, two daimler dingos, one 17 pounder antitank gun with towing vehice, one 25 pounder howitzer with tow vehicle, airborne bulldozers, and a variety of other equipment and supplies. At over 16 tons loaded with a tank, the Hamilcar required heavy bombers to tow it, the usual combination being the Hamilcar towed by the Halifax four-engined bomber. The crew consisted of pilot and co-pilot sitting in tandem, one behind the other. Access to the cockpit was by entering the cargo bay, then climbing a ladder to a hatch in the roof behind the cockpit, with the pilot and co-pilot entering the cockpit through a perspex door on each side, in a manner similar to a fighter. Communication of the crew to the towing aircraft was through a wire connecting the glider cockpit to the bomber cockpit. Upon reaching the target area, the glider released from the tow rope and landed on it's wheels, with skids on the bottom of the fuselage in case the wheels failed or were jettisoned. As soon as the glider came to a stop, the pilot and copilot exited the cockpit, and slid down over the sides of the fuselage jumping to the ground. Each of them went to one of the two wheel struts, and released valves that let the pressure out of the struts, which lowered the fuselage to the ground so that the vehicle or load inside could exit the glider more easily. In the case of a tank or other vehicle, there was a flexible tube that connected the vehicle exhaust to a port in the side of the glider so the smoke would be blown outside. The tank would start its engine while the glider approached the target, and the crew would mount and buckle into their vehicles with special harnesses that had been installed. As soon as the glider lowered to the ground, the lashings holding the tank would be released, and the tank driver would then roll forward. This pushed down on a pressure plate on the floor which operated a levering system that automatically opened the glider nose to the starboard (right) side, and the tank would roll out of the glider and straight into action. Excellent photo showing a Halifax bomber towing a Hamilcar glider over the English countryside. This photo was purportedly taken on the evening of D-Day, towing one of the 6th Airborne Armoured Reconnaissance Regiment's tanks toward Normandy during Operation Mallard. The glider is in the "high tow" position. This allows the pilot to keep the glider above the slip stream of the towing aircraft, which keeps the glider from being thrown around, with possibly catastrophic results. 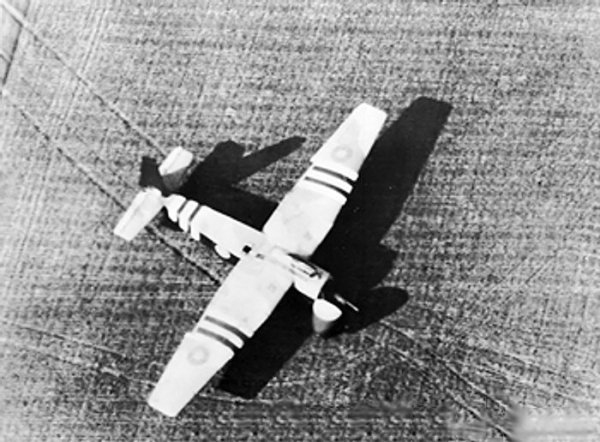 The black and white stripes painted on the fuselage and wings of the glider are for easy recognition of the aircraft as a "friendly" to allied air, ground and naval forces. The above photo shows three Hamilcar gliders coming in to land on LZ "N" on the evening of D-Day, carrying the tanks of 6th Airborne Armored Reconnaissance Regiment. The photo at right shows a Hamilcar glider after it's load has debarked, during operation Market Garden. The nose can be seen in the open position, and the tracks of the vehicle that has exited and driven off, as well as another vehicle. Link to a youtube video showing a Hamilcar glider in flight, and after landing with the pilot sliding off the fuselage and a Lloyd carrier debarking. Link to Arnhem Jim's website page on the Hamilcar glider. Link to Sanger Models to where you can buy a 1/72 Hamilcar vacuform plastic model kit. Link to a hobby shop where you can buy a 1/72 "Planet Models" resin kit of the Hamilcar. Shop around, you may find it cheaper.